This is my son, Ruger (8-years-old), standing next to a Yamaha TTR50 dirt bike. The 50cc bike is too small for him, but it REALLY helped him to gain confidence quickly on a smaller bike for the first several rides. I recently purchased a 50cc dirt bike for my 6-year-old son and I did a ton of research into the different 50cc bikes available to see which one was the best. In the end, most of the 50cc dirt bikes are excellent and there are very few differences between them. While there are a few lemons to avoid which I’ll highlight in this post, your decision will likely be made by which one you find available at a good price near you. Having said that, my favorite 50cc dirt bike is the KTM 50cc (very expensive), followed by the Honda CRF50 and the Yamaha TTR50. If your kid is very serious about dirt biking, or if you’re made of money, then it’s tough to beat the KTM 50 SX Mini. It’s an incredible bike, but you have to pay for the quality. This is a racing bike and if that’s your aim, then it’s a good choice. Disc brakes on the front and back, adjustable handlebars, liquid cooling with a radiator, inverted front forks, and other features make this act like a higher-end bike, but on a smaller scale. However, this is a 2-stroke bike so you’ll have to mix oil at a ratio of 60:1. I personally knew I didn’t want a 2-stroke when I was shopping because all our other dirt bikes are 4-stroke and I didn’t want to mess with mixing fuel for different bikes. However, 2-stroke has advantages such as low-end grunt. If a friend or neighbor were to ask me what 50cc dirt bike to get, my short answer would be to get a Honda CRF50. I’m not alone. Time and time again when I hear from experienced riders, they say they put their kids on a CRF50. They are only $100 more expensive than the Yamaha TTR50, but they include a kick start which, in my opinion, should be standard on absolutely every dirt bike. While the kick start is really nice to have if you accidentally left the key in the “on” position and can’t use the electric start, keep in mind that most kids won’t be able to kick start the bike. It’s just a little too hard for most kids. I’ve seen some 6-year-old kids who can do it, but even my 8-year-old struggles. The kick start is mostly for that parent. 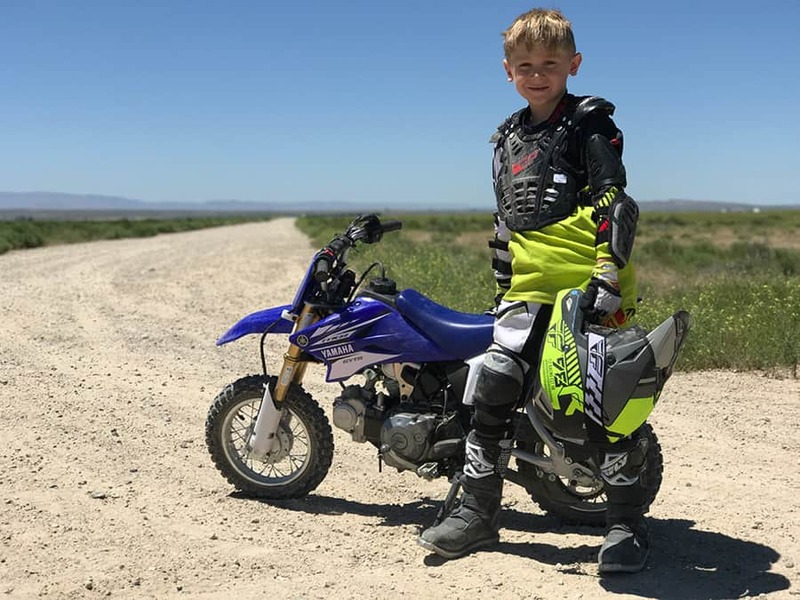 The Honda CRF50 and the Yamaha TTR50 are the most popular options because they are incredibly reliable, reasonably priced, and are set up with similar controls to an adult bike so the kid can easily progress to bigger bikes as he or she grows. In almost every other respect, however, the CRF50 is basically identical to the Yamaha. In fact, if you were to switch the plastics on a CRF50 to something blue, most people wouldn’t even know the difference. There are differences, of course, but they aren’t obvious. The one difference you may notice, however, is that the CRF50 isn’t as fast as the TTR50. The CRF50 tops out at 25mph and the TTR50 can get up to 30mph. The Yamaha TTR50 is a very reliable and well-built dirt bike at a reasonable price. This is the dirt bike I bought for my 6-year-old and it’s been great. I got the Yamaha TTR50 because I found a decent deal on it, but if I were buying again, I would have preferred the CRF50 from Honda if one had been available. I paid $1,250 for a brand new TTR50 at my local shop, but after taxes, registration and fees, I was closer to $1,700 if I remember right. If I could have found a lightly used 50, I would have bought it, but in my local area of Boise, Idaho, there just wasn’t anything out there when I wanted to buy. We have had a good experience with the TTR50. It runs great, my son LOVES it, and we haven’t had any reliability concerns. I taught my son to turn off the bike with the key and to never use the kill switch. If he uses the kill switch to stop the bike, the battery is still in the “on” position and then the next time we use it, the battery will be dead and we won’t be able to start the bike. There is no kick start on this bike. The top speed on a TTR50 is right at 30mph, so it’s a very capable bike for kids. The TTR50 is faster than the CRF50, which tops out around 25mph. I wouldn’t want my kids going faster than that anyway. However, kids under 8 years old normally aren’t strong enough to use a kick starter anyway. So the benefit of the kick starter is really only for an adult to start the bike for the kid if the battery fails. Check out my full review of the Yamaha TTR-50. Suzuki makes some great dirt bikes that are comparable to the Yamaha and Honda in every way. Best of all, Suzuki puts electric start and kick starters on their bikes just like Honda. Thank you, Suzuki! I don’t personally have much experience with the Suzuki, but it’s well-reviewed. They just aren’t widely available in my local area so I don’t see them as often. The Yamaha PW50 is the slightly twin brother of the TTR50 who was born 10 minutes later. The bikes are almost identical in the size (although the TTR50 is actually 1.5″ higher in seat height), but the biggest difference is in the engine. The PW50 is a 2-stroke which is oil-injected so you don’t need to mix gas/oil each time. The TTR50 is a beefier 4-stroke. Most riders agree that the TTR50 is a better bike, and it’s only $100 more expensive than the PW50. However, it’s more that they are just different bikes. I would recommend the PW50 for very young kids (3-4 years old), and the TTR50 for 5-7 year old kids. The SSR bikes are the cheapest dirt bikes out there. You can buy one brand new for as little as $700. Some people buy them as just fun “crash up” bikes, and some people have good experiences with them; however, unless you’re very handy and you don’t mind working on your bike regularly, I would highly recommend staying away from this and the other Chinese-brand bikes. They are basically lawn mowers with wheels. While the quality of an SSR is simply not on the level of a bike from the major manufacturers, it still could be a great option for you. If you’re very handy and know how to fix things when they go wrong, you have a limited budget, and you really want to buy new, then this is your bike. I heard from one guy who bought one and after almost a year of almost daily use, it had only broken a few minor things, which would be the same as any Honda or Yamaha. Not everyone has a bad experience with these bikes. Very little. If you change the oil in a 50cc bike, and it’s a good quality bike from a good brand, you’ll likely have it run for 15 years without any major repairs. They are generally reliable and easy to maintain. Remove the starter battery at the end of each season and put it on a trickle charger throughout the winter. Otherwise, you’ll have to buy a new one ($35-$70) at the start of the next season. However, 50cc bikes use much thinner tires than most dirt bikes, so it is more likely to get a flat on them than on some other dirt bikes. Dirt bikes–especially the 50cc bikes–generally hold their value very well. Anyone with experience knows that these bikes run just fine for more than a decade with minimal maintenance, so people are glad to save a little money from the new price. Unless you’re buying a high-performance KTM or another racing bike, I’d recommend not spending more than $1,100 on a used 50cc dirt bike. Brand new – $1,200 or $1,300 list rate, but the stores always have special fees and taxes and crap. So it’ll likely be $1,500 to $1,800 by the time you walk out the door. If you keep your kids inside and don’t go on any adventures with them, then yes, they’ll be safer. They’ll also turn out like the fat video-game-playing lazy kids like I so often see. At the same time, I obviously don’t want to put my boys in harm’s way. All of these dirt bikes can get up to 25-30 miles per hour when in the top gear and a WOT (wide open throttle). I keep my 6-year-old in second gear all the time. This reduces his top speed so he can’t get into too much trouble, and he also feels more comfortable in second gear. His bike also has a throttle stop so I can cap his top speed, but I haven’t found that to be necessary because I can just keep him in second gear. Personally, I believe dirt bike riding for kids as young as 4 years old is a reasonably safe activity as long as you keep them in first or second gear, always have them wear quality safety gear on every single ride, and carefully watch them. With these precautions, I’m satisfied that dirt biking is an excellent activity for my family. I’m willing to risk a broken ankle at some point if it means I get to spend many years bonding with my kids out in nature and helping them to develop confidence, courage, and knowledge. Dirt Biking Dangers: Is it a safe family sport?